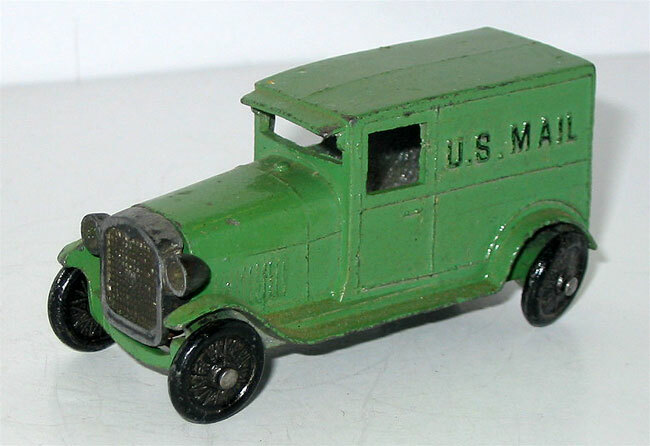 Last month we wrapped up the "early" Mack series, which lasted in some form until the Second World War curtailed production of metal toys. 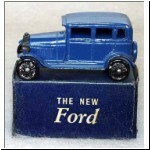 This month we'll go back to the next introductions after the first Macks. 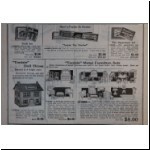 I have not seen catalogues for 1926, 1927, or 1928, though there is a 1928 ad from an N.Shure catalogue which has already been widely circulated amongst the collecting fraternity. 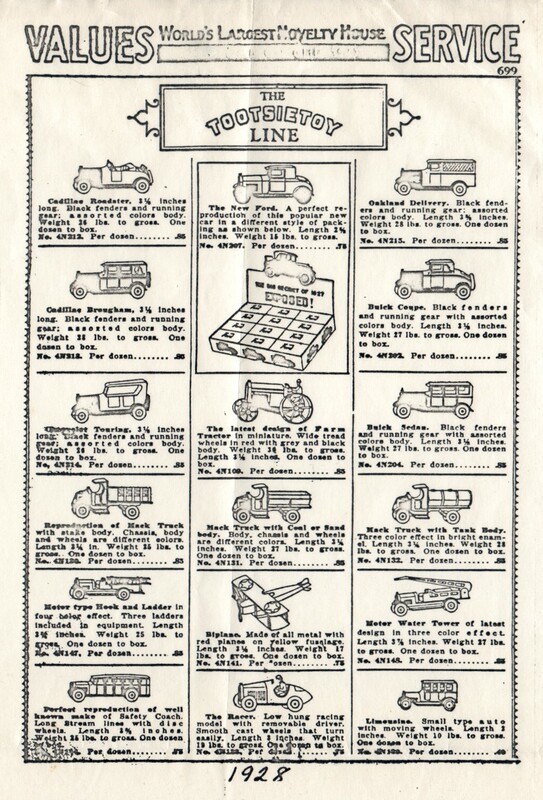 So I'm not dead sure of which years saw just what during this interval, and may be off by a year. 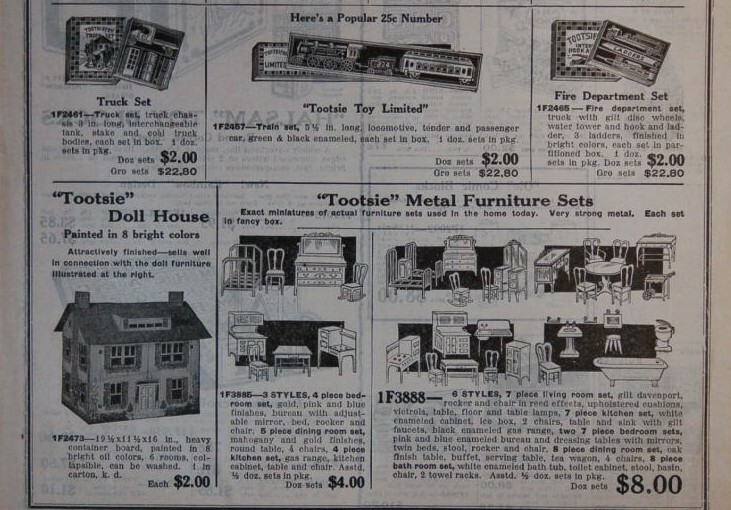 There is a 1926 catalogue supplement known to exist, suggesting that Tootsietoy continued to use the 1925 catalogue with the supplement showing new issues (page 283 in ref.5). 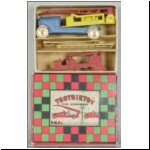 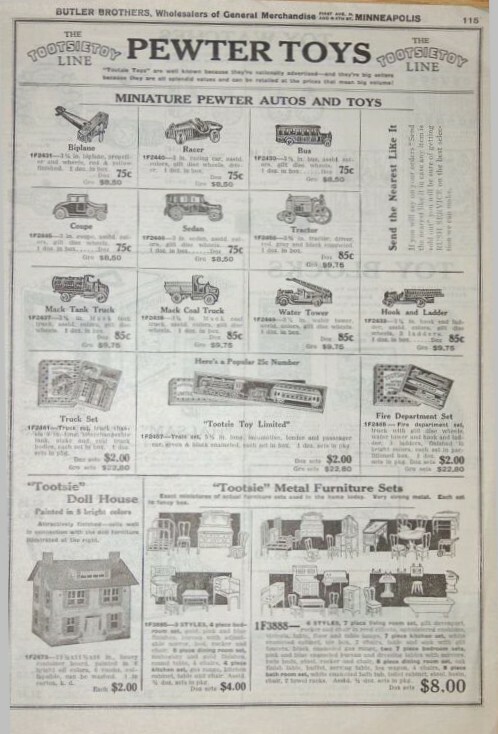 Tootsietoys were also included in the wholesale catalogues of Butler Brothers from 1927 to 1930 and these are reproduced on this page and the next. 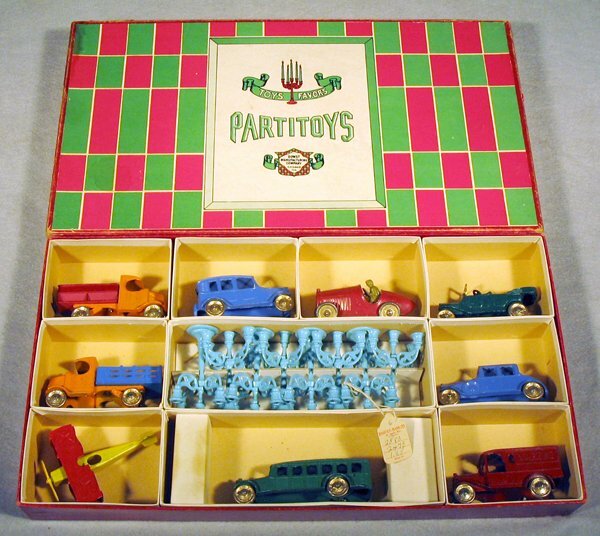 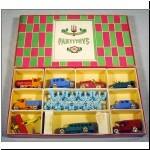 This "Partitoys" gift set looks like it is from this period. 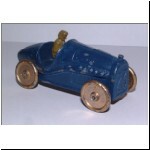 One of the few cars to have wheels other than the standard discs was a small racer (no.23) with that number cast on its radiator. 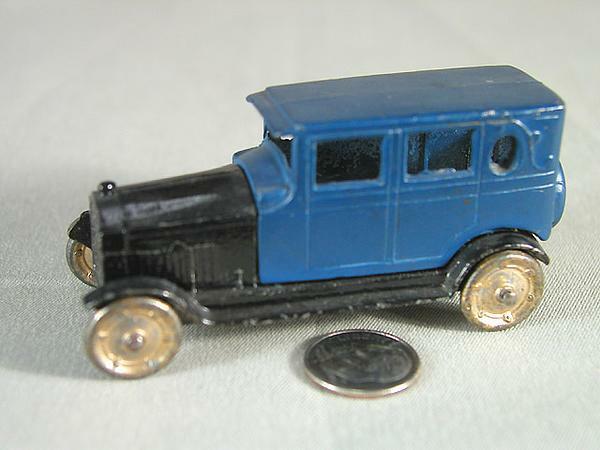 It was originally issued (in 1926) with a removable driver. 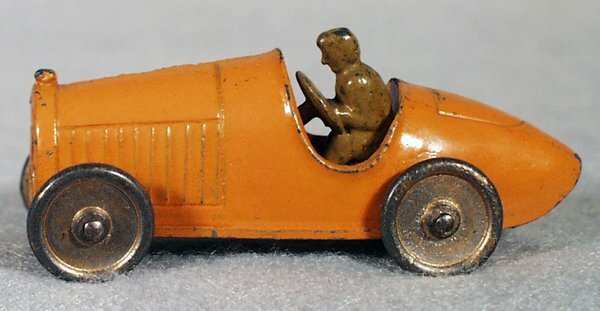 In keeping with the risks of his profession, he was usually promptly lost, and most of these racers extant today have a small vacant square hole in the seat in his memory. 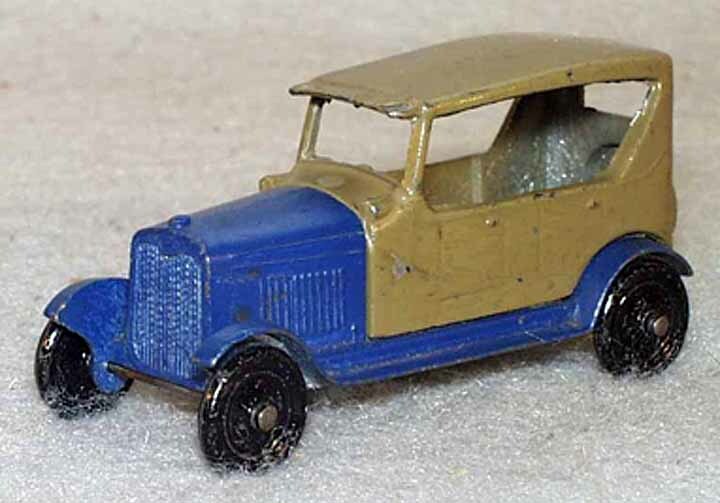 Later versions had the peg in the driver's seat peened over, and a few with this permanent driver have survived. 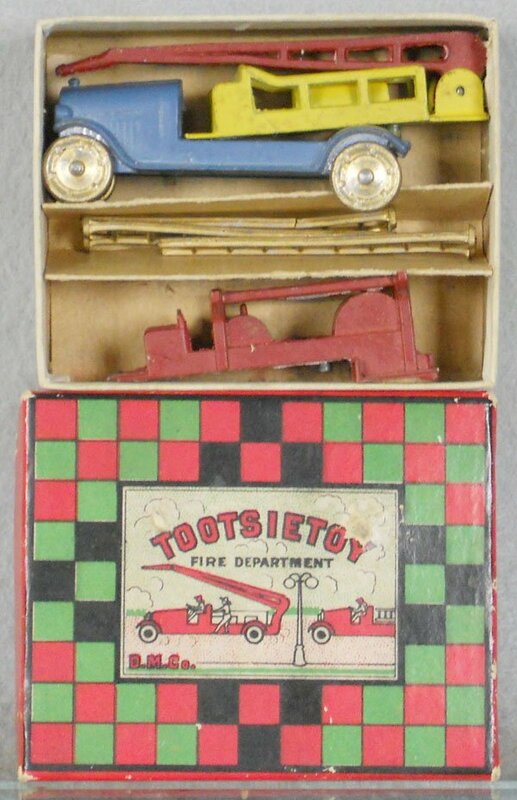 A popular pair of releases were two fire engines, no.4652 hook and ladder and no.4653 water tower, issued in 1927 (ref.1). 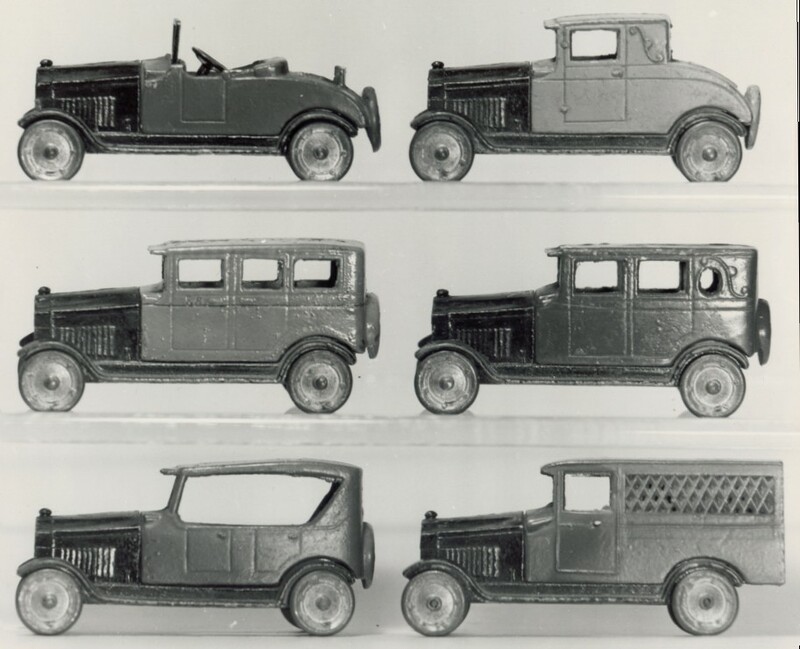 These had the same chassis casting with different bodies. 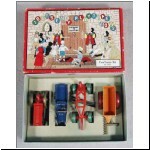 They were also sold in a boxed set with one chassis and the two interchangeable bodies. 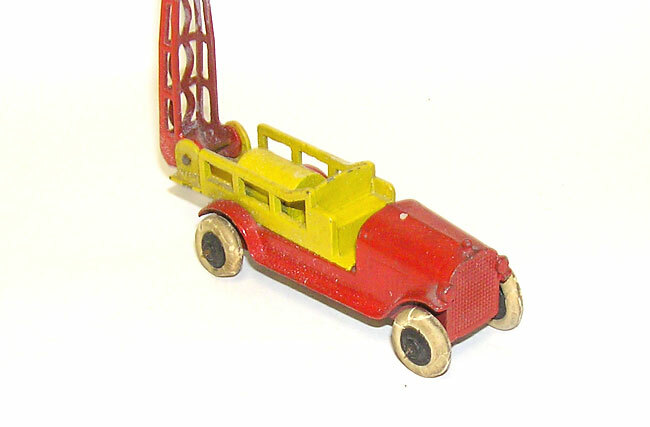 The red (or blue) and yellow water tower had the boom hinged at the rear to allow it to swing erect. 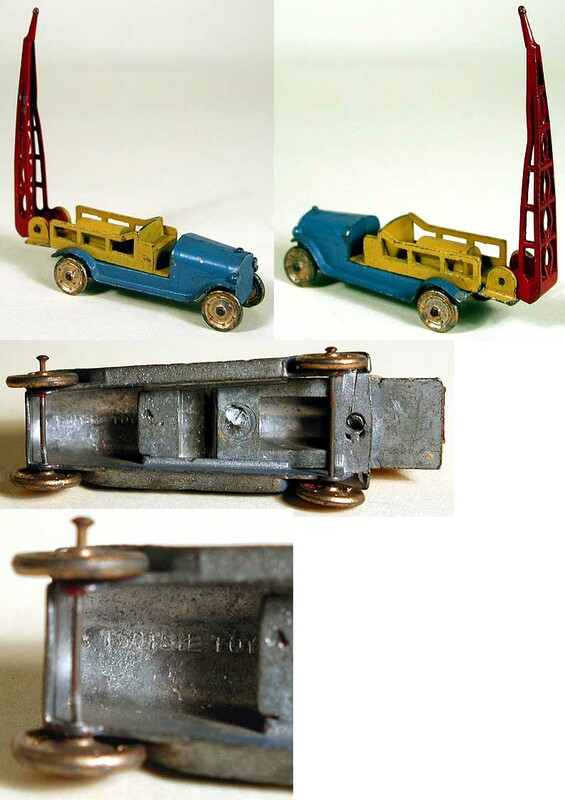 The red and blue hook and ladder was fitted with three gilt ladders, and rings at the bottom of the ladders allowed them to be interlocked and erected on small lugs on the rear platform. 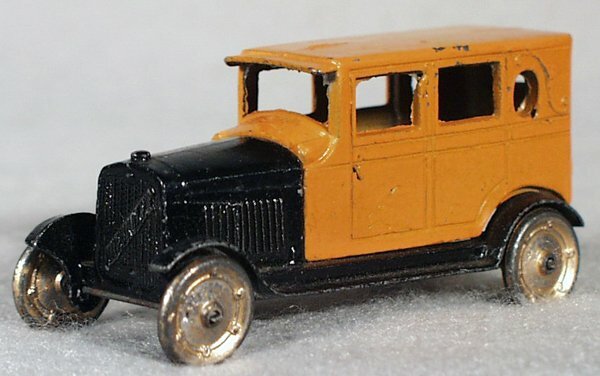 A typical bus of the day, no.4651, similar to those on the road made by Fageol and Yellow Coach, represented a small vehicle by today's standards, being much like the elongated airport limousines with doors on each side for each rank of seats (introduced 1926). 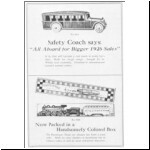 The catalogue merely described it as a "perfect reproduction of a well-known make of Safety Coach". 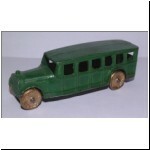 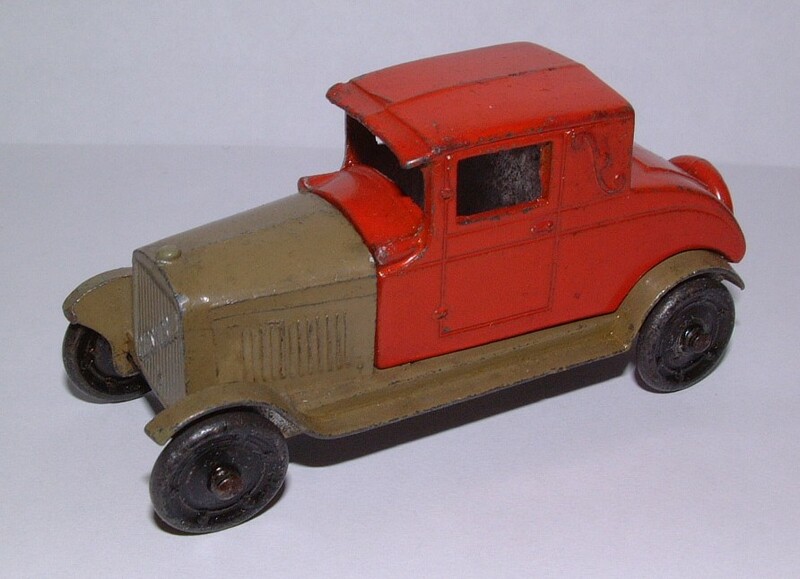 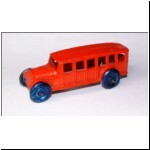 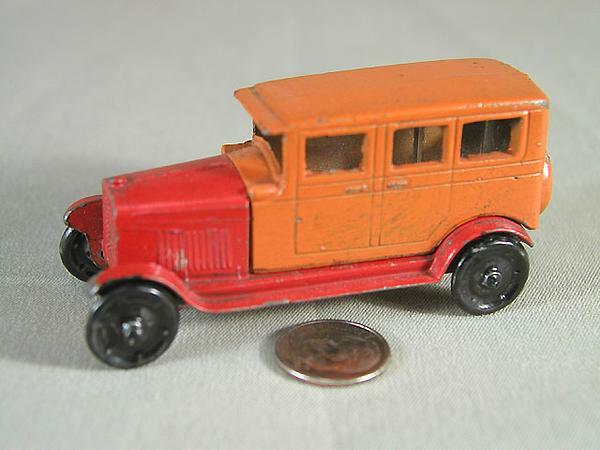 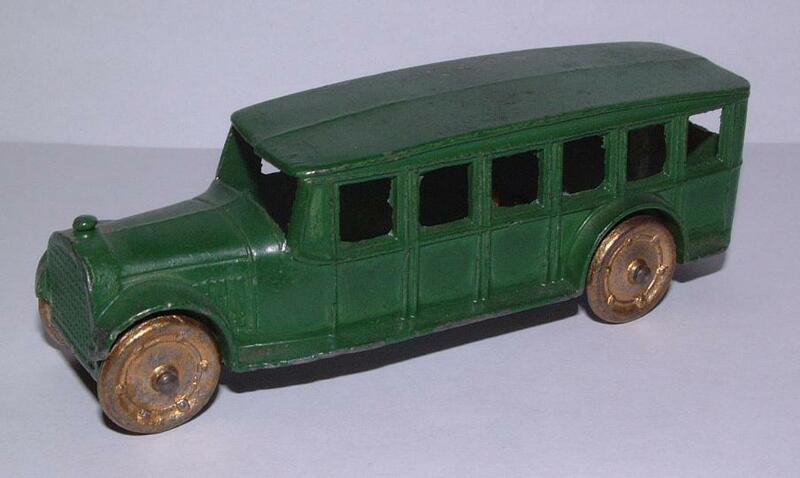 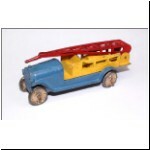 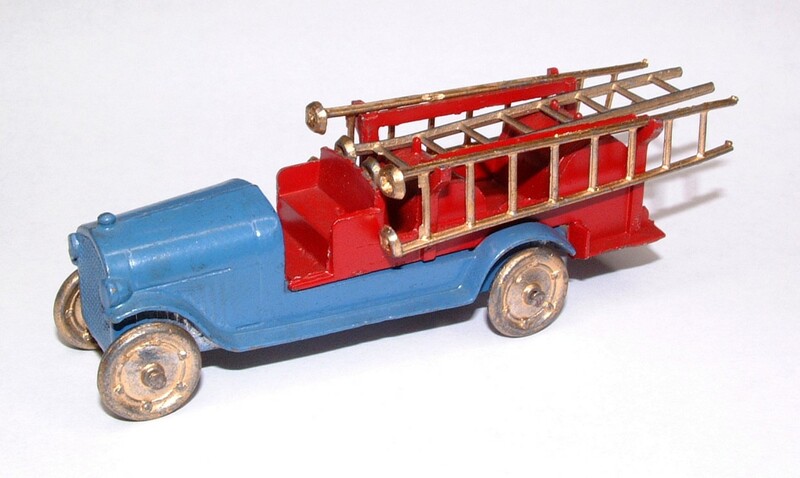 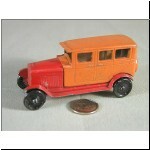 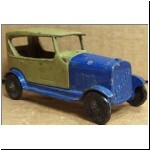 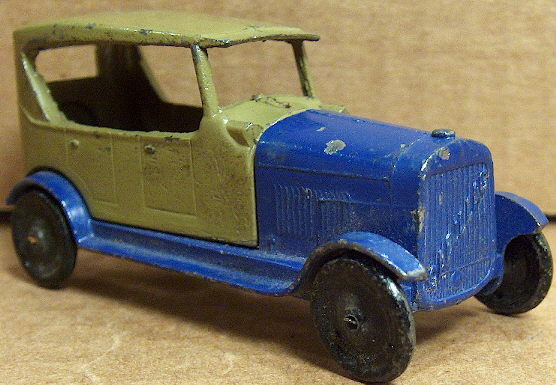 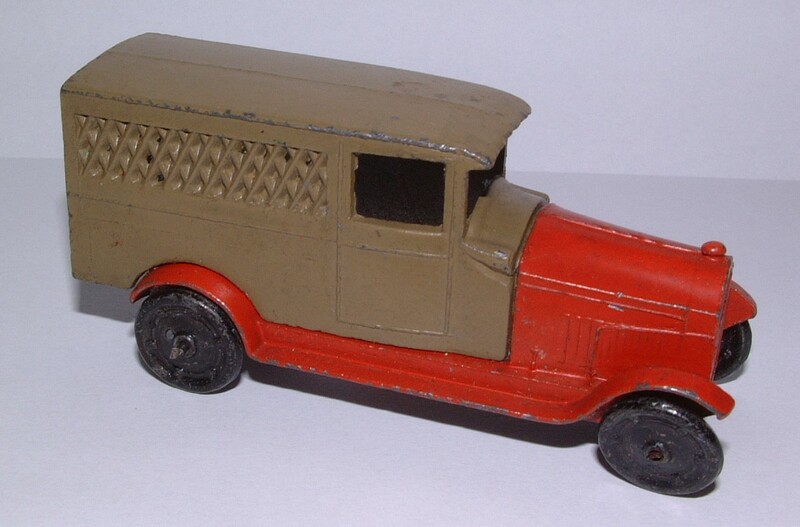 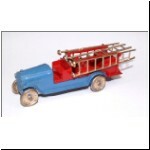 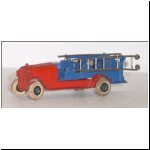 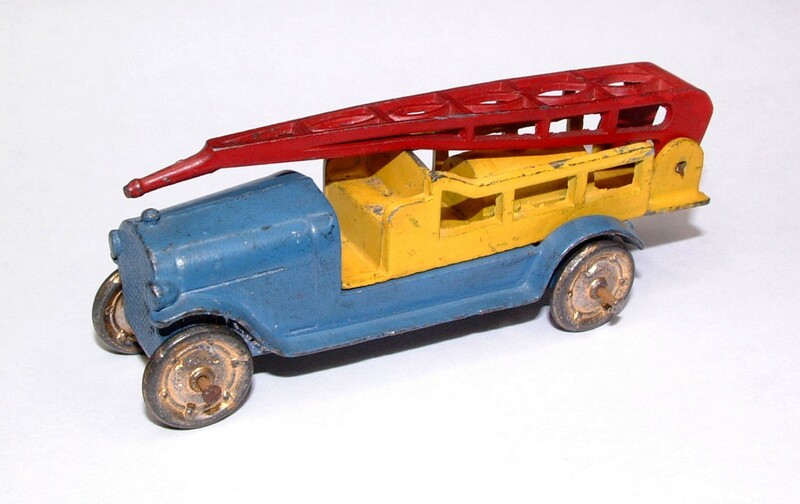 It must have been a popular toy, as, along with the fire engines, it is among the less rare from the period in collections today, despite being joined in 1929 by the harder to find "Overland Bus Llnes" model. 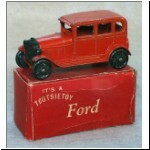 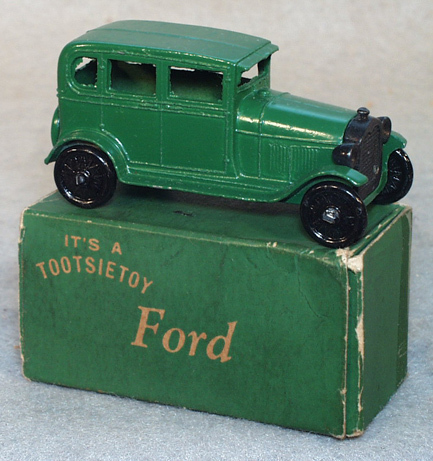 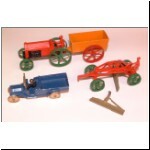 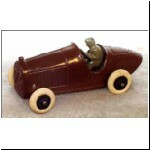 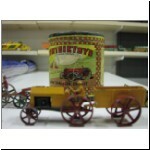 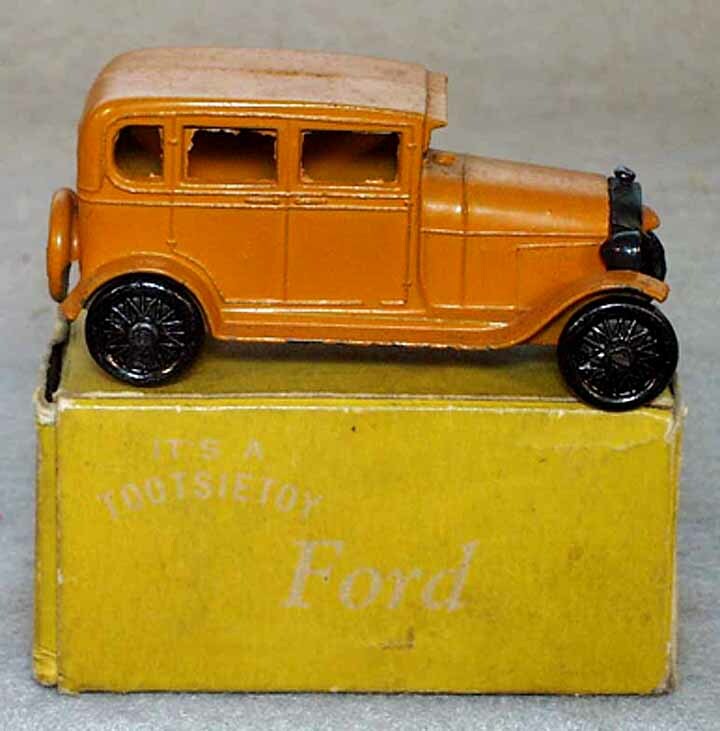 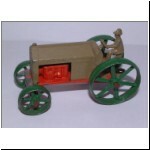 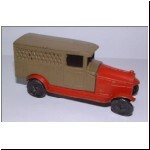 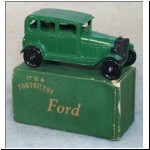 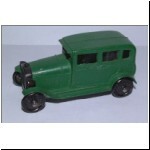 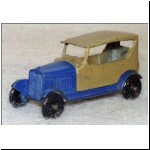 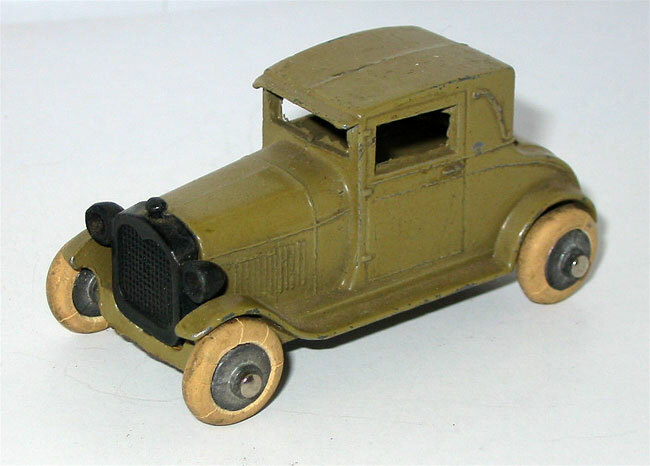 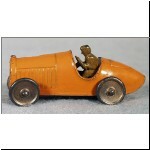 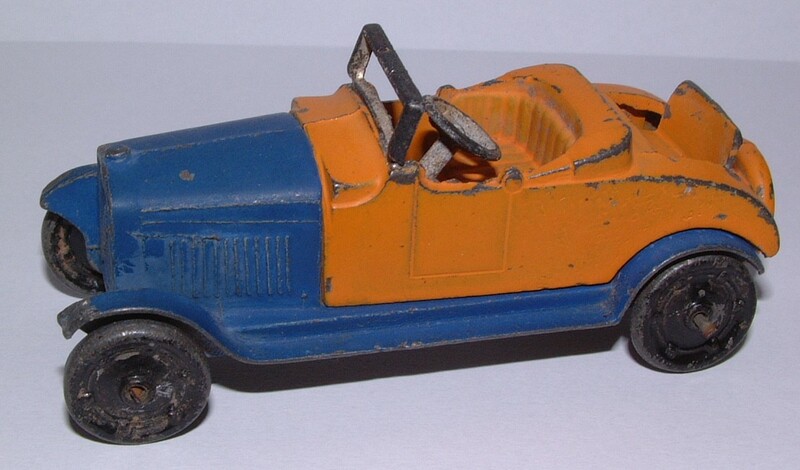 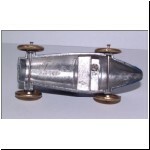 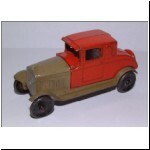 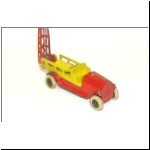 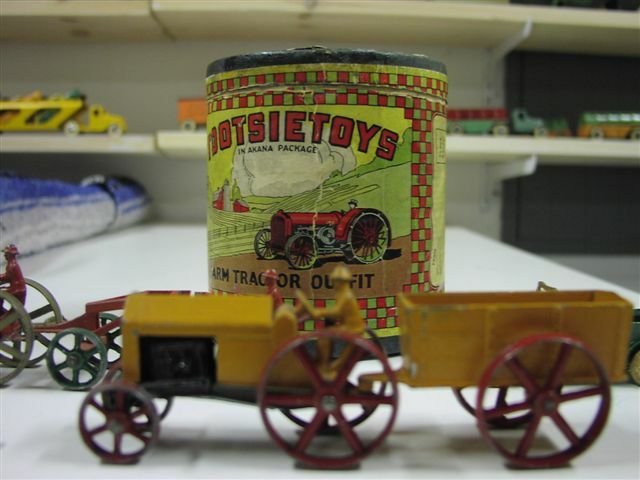 The model in the second picture is a copy of the Tootsietoy made in England by Johillco and introduced around 1932. 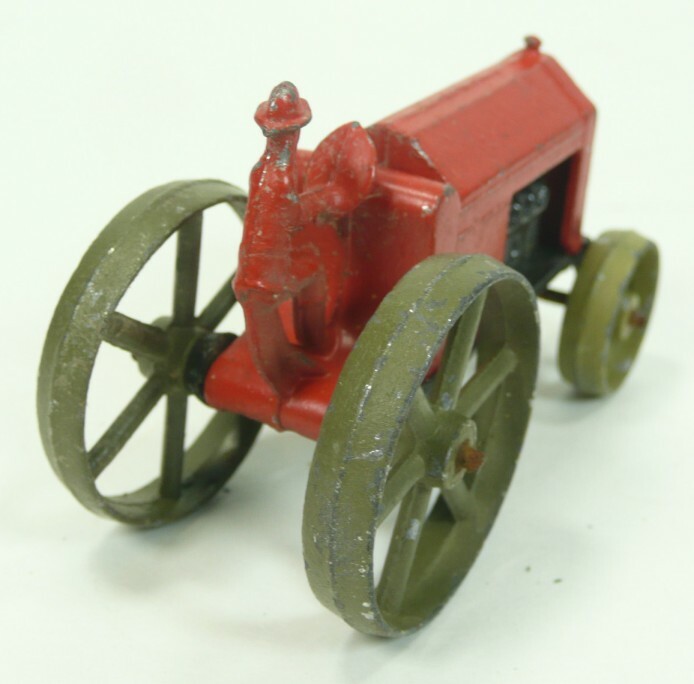 A beautifully detailed farm tractor, no.4654, was a two-piece casting, with the engine showing through the open sides of the hood and an integrally cast driver on the saddle. 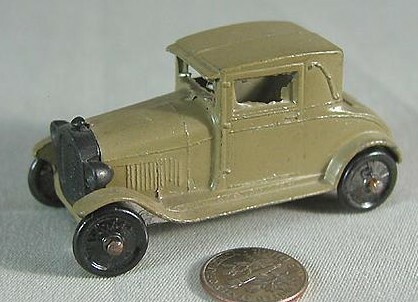 It was issued in 1927 (ref.1), and from 1928, it was fitted with a tow-rlng and sold in various sets. 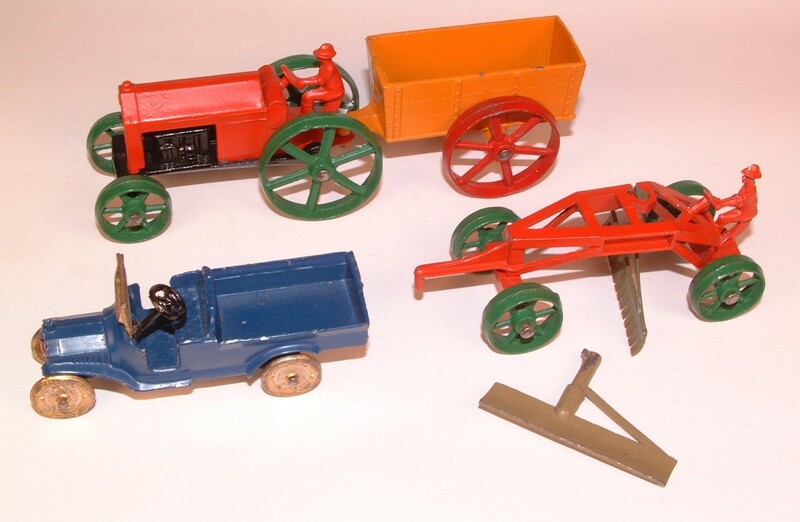 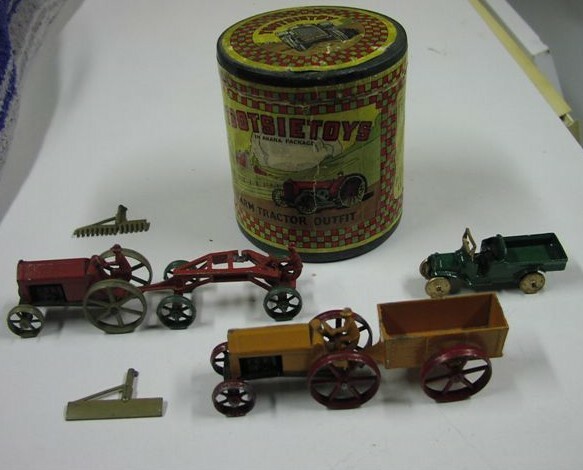 The "Farm Tractor Outfit" pictured included a box trailer and a road scraper which had interchangeable blade and rake pieces, as well as the Model T Ford truck. 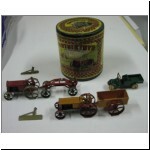 This was one of several sets in "Akana" packaging - literally a can-shaped mailing carton - which were produced from 1928 to 1930, after which the tractor set was packed in a normal display box (no.7003). 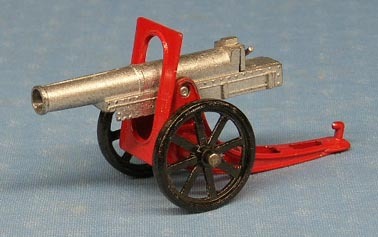 A later set had the tractor towing a cannon (there were howitzer and mortar versions), and the tractor was modified for these military sets by shortening the hood and adding a large ammo box, with lettering "U.S.A. W-1881" cast, at the rear. 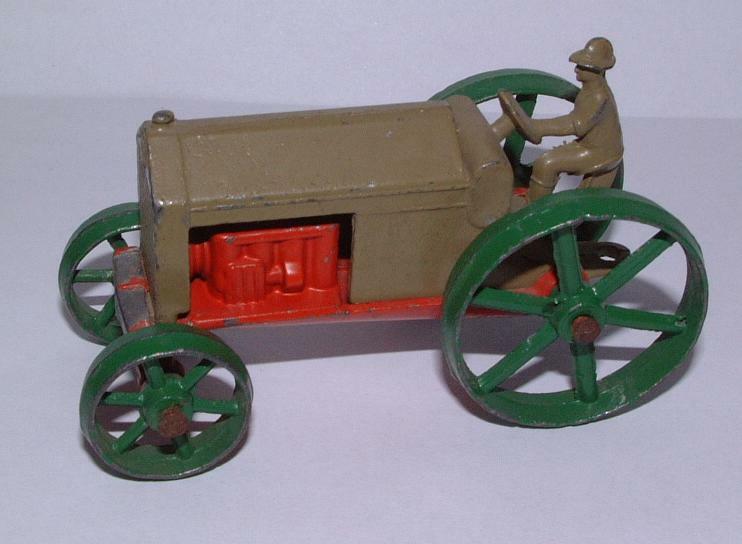 The army version is quite a bit scarcer than its bucolic brother (see photo in part 4). 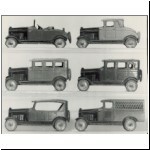 Thls group of cars, introduced in 1927 (ref.1), consisted of six different bodies which were interchangeable on four different chassis, and thus allowed for 24 different versions, each with its own catalogue number. 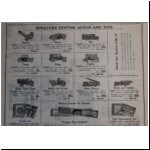 The numbering was systematlc, but too complicated to go into here. 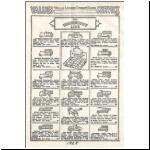 I'll leave it to you to figure it out on the master list, to be published at the conclusion of this series (parts 8 & 9). 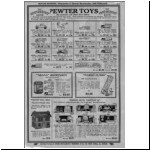 Suffice it here to say that they span numbers between 6001 and 6306. 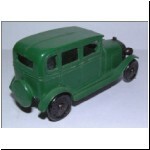 The six bodies were: roadster, coupe, sedan, brougham, touring car with the top up and a screenslde panel delivery van. 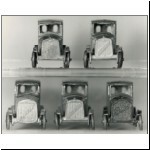 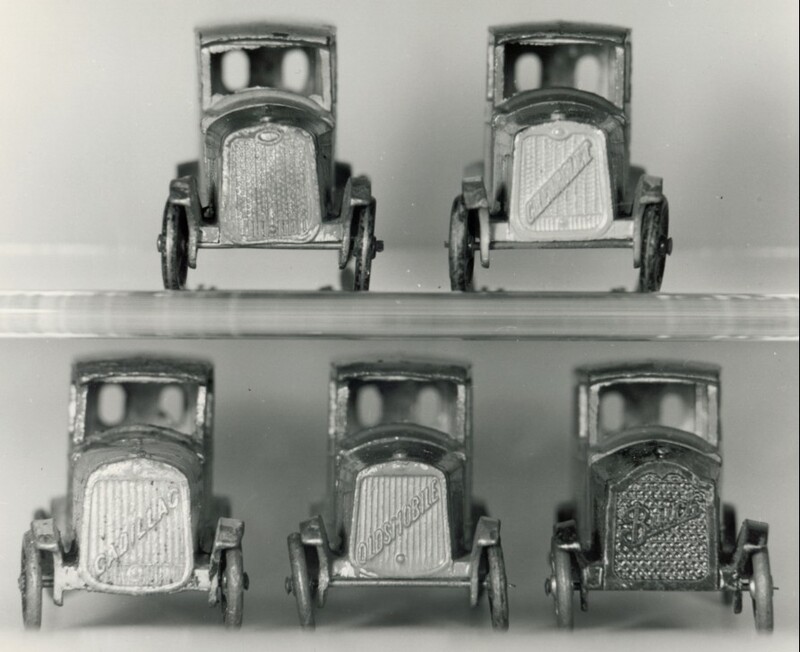 The four GM chassis were Chevrolet, Buick, Oldsmobile and Cadillac. 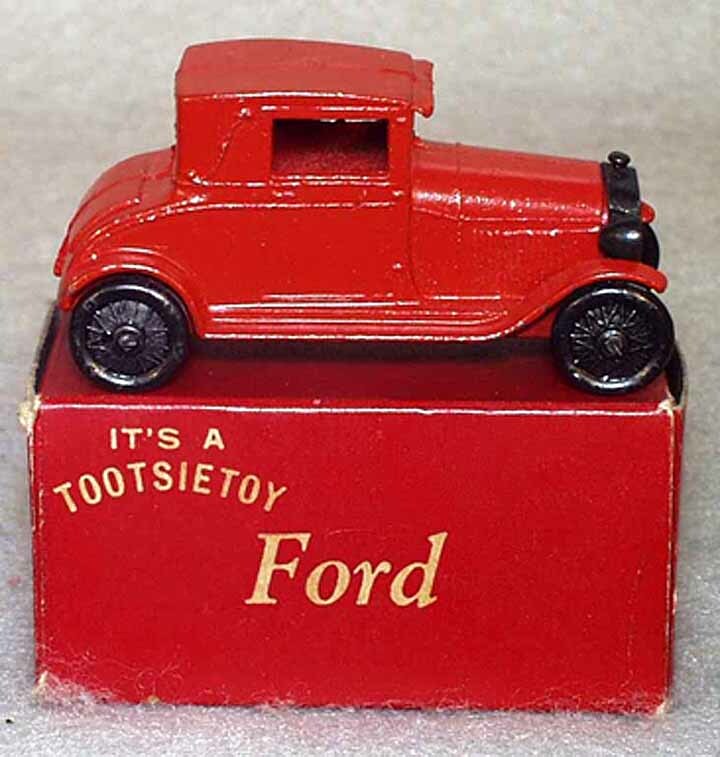 These were dimensionally identical from the cowl to the rear, where the body pieces fitted, but differed in the size and length of the hood (bonnet) and radiator, as well as in the grille pattern and the embossed name across it. 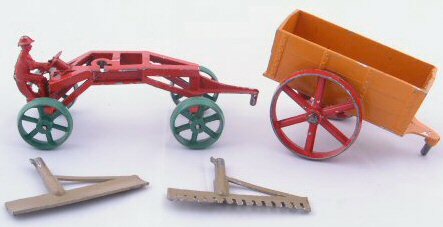 The body and chassis pieces were always in contrasting colours, the chassis in medium blue, black, red, yellow-orange and tan-ish olive, and the bodies in red, yellow-orange, green, dark blue and the tan-ish olive. 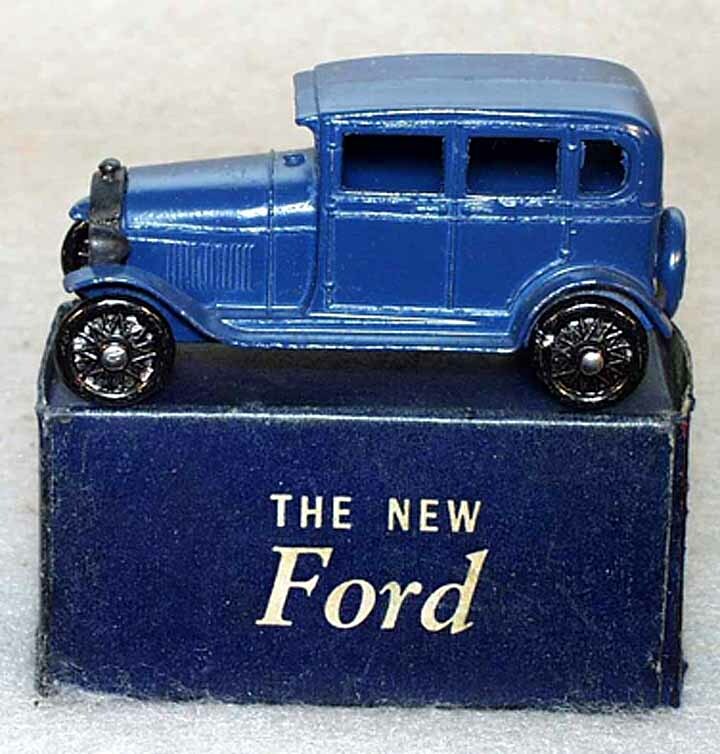 Late in the series, a nameless version was introduced with a grille only slightly different from the Chevrolet and a slightly larger oval emblem at the top. 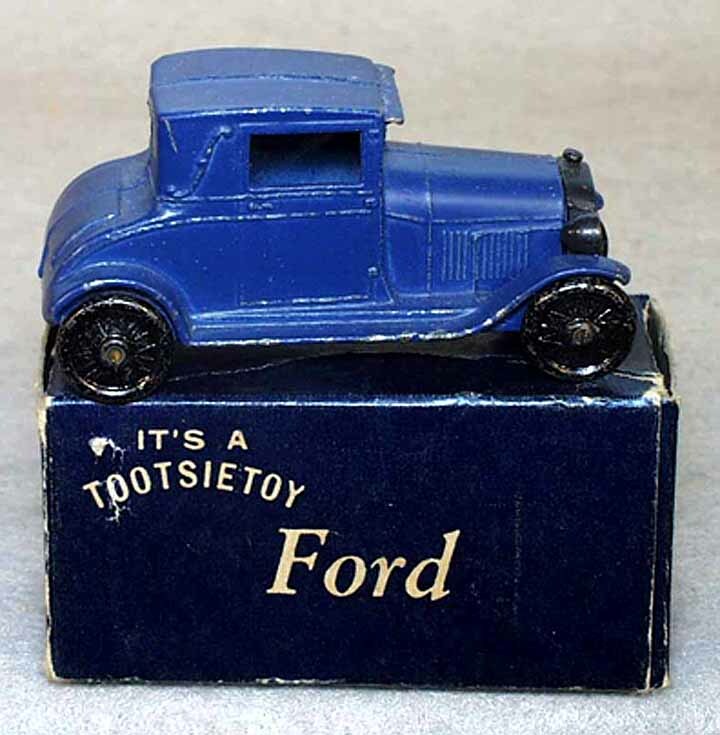 Some collectors are sure that this is the Chevrolet trade-mark, but all of mine, some in mint shape and very clean castings, cannot be credited with more than being a smooth, oval blob. 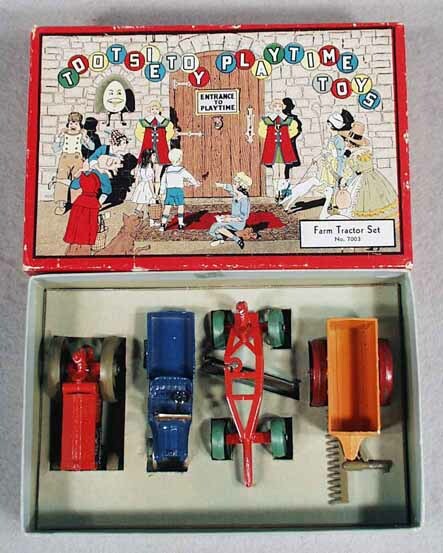 A word should be injected here to state with almost absolute assurance that there never was a member of the series marked "Oakland". 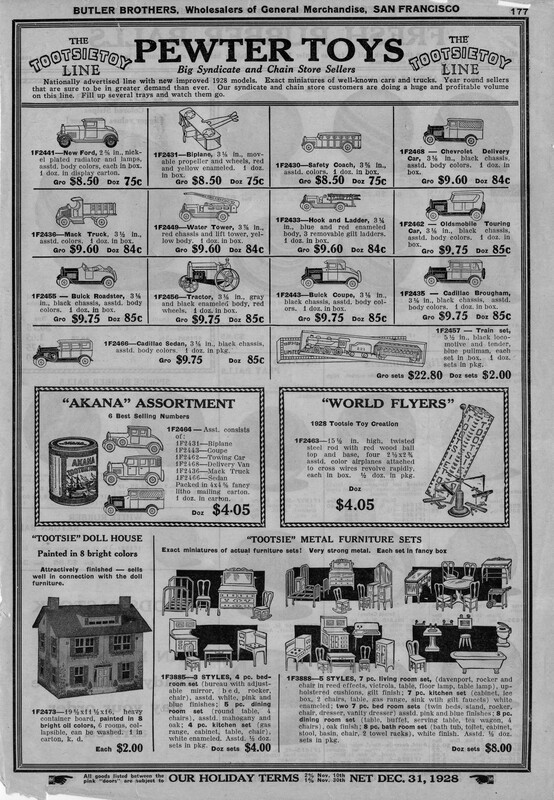 The 1928 N.Shure ad (pictured here) notes an Oakland delivery van, but this is certainly a misprint, and should have been "Oldsmobile". 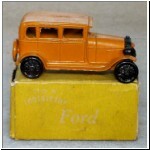 There are many compelling reasons for arguing that an Oakland was never made, amongst which are the phasing out of this marque in favour of the Pontiac at the time the models were made, the simplicity of packaging of a line of an even two dozen different types, the absence of any mention of an Oakland in available catalogues and the inability of any of the people employed at the plant at that time to recall an Oakland today. 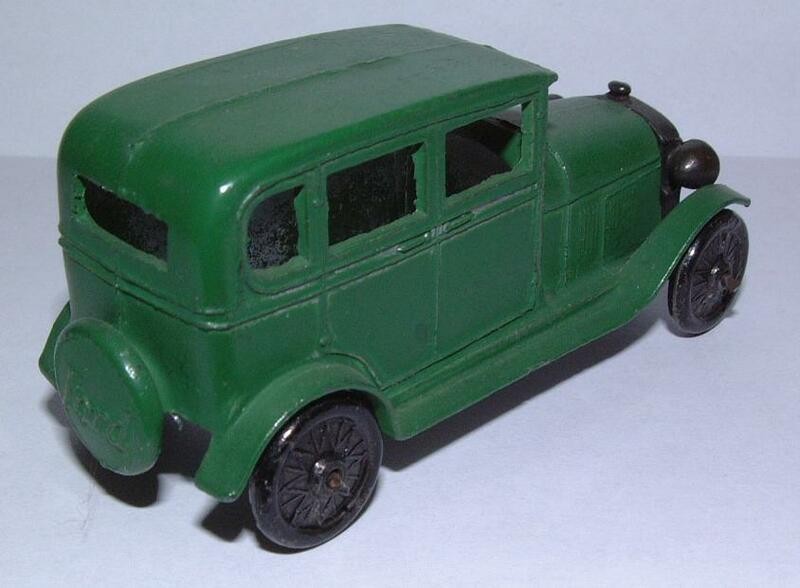 Probably the most compelling reason to exclude it is simply that I know of none in anyone's collection, whilst a few hundred other GM models have passed beneath my admiring gaze. 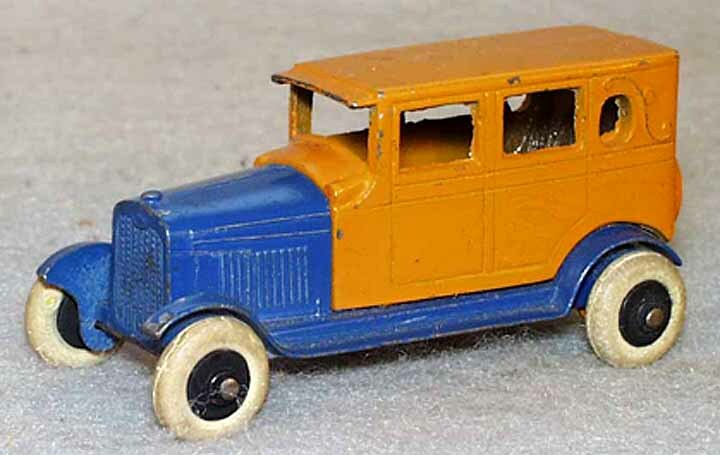 l'd be delighted if any reader could prove me wrong (I said prove, and you can do so simply by mailing the Oakland to Andover for authentication, if not permanent display in the museum). 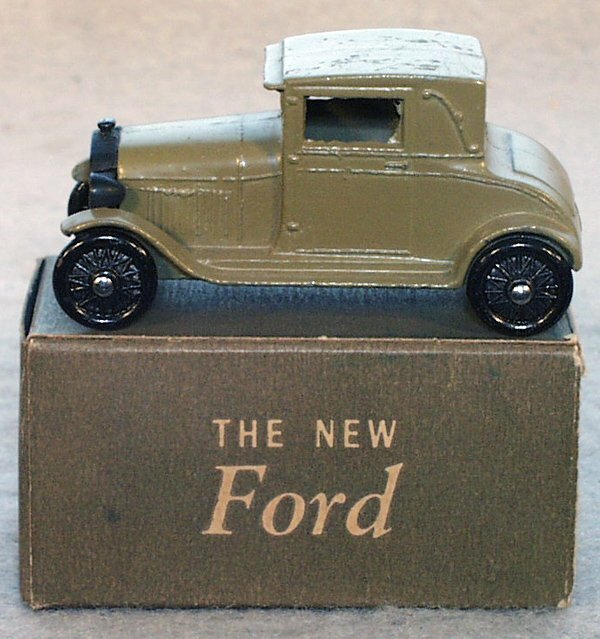 In the autumn of 1927, Henry Ford introduced the new Model A Ford, which was developed under the tightest wraps of secrecy. 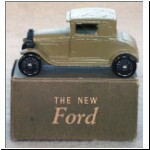 A few months later, Dowst introduced the coupe (no.4655) under the banner "The big secret of 1927 exposed!" 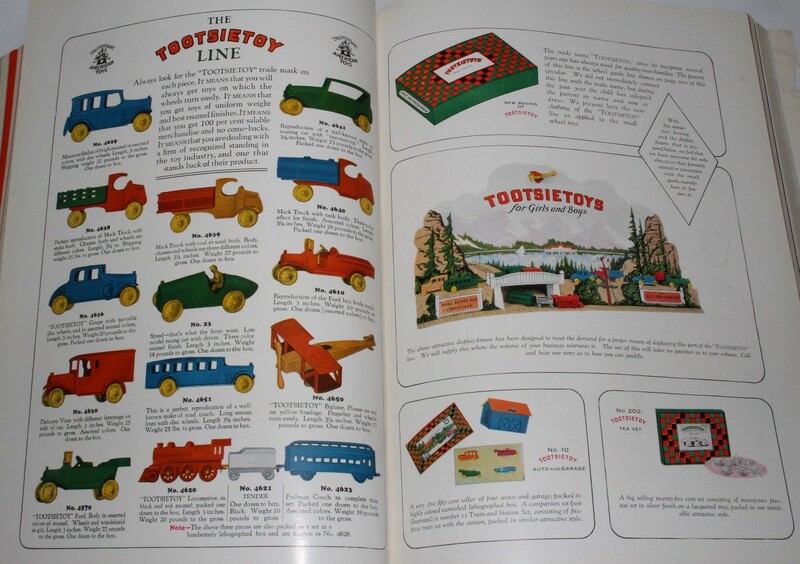 lt was likely the toy scoop of the year. 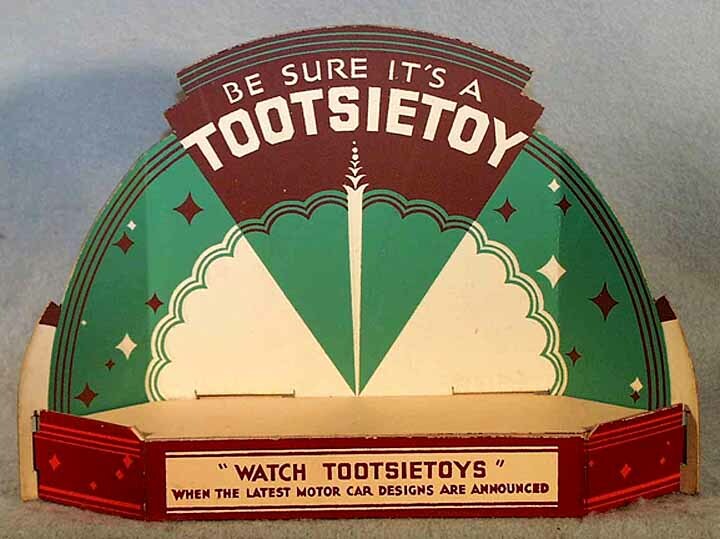 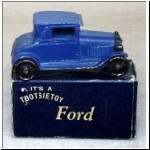 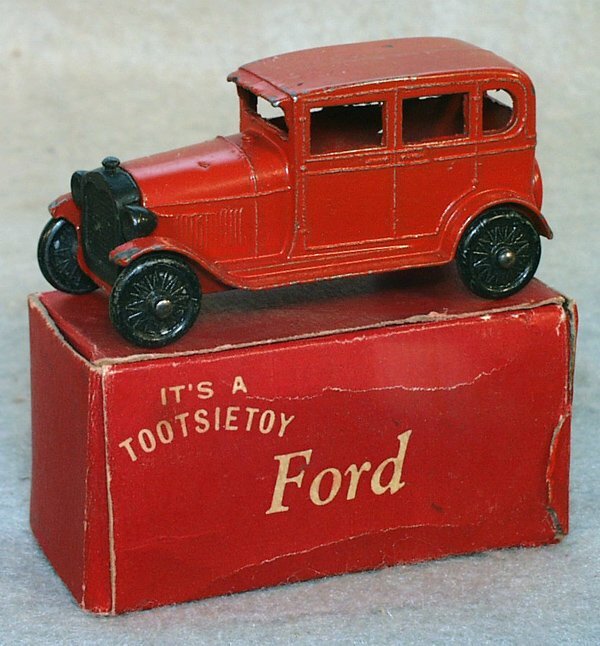 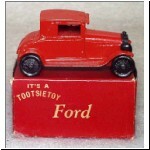 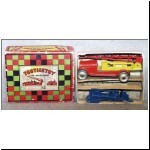 It was the first Tootsietoy to be sold individually boxed, a practice later made standard by Dlnky and most other major manufacturers after World War II. 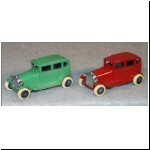 The boxes were in four different colours, coinciding with the paint on the models enclosed: red, blue, green and khaki. 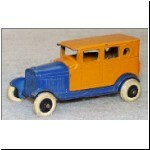 (Clint mentioned a yellow version, but that seems to apply only to the sedan. 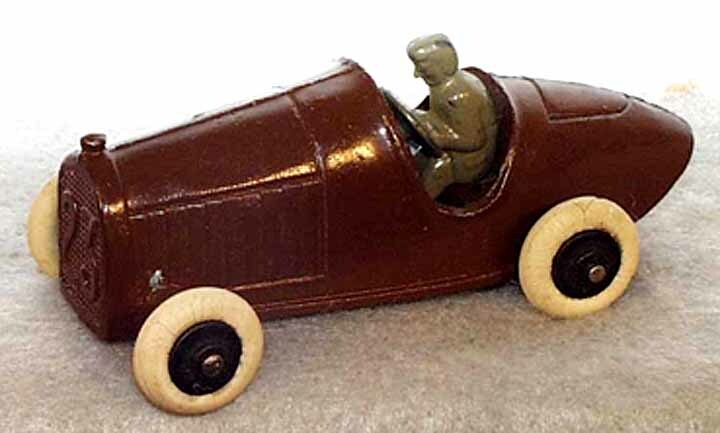 The red, blue, green and brown colours of the coupe are mentioned in the 1929 leaflet pictured in part 4). 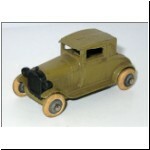 The khaki coupe was also sold in military sets a few years later. 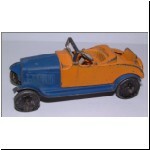 The coupe was intended to represent the convertible roadster with top up, and had landau "S" irons on the rear quarters. 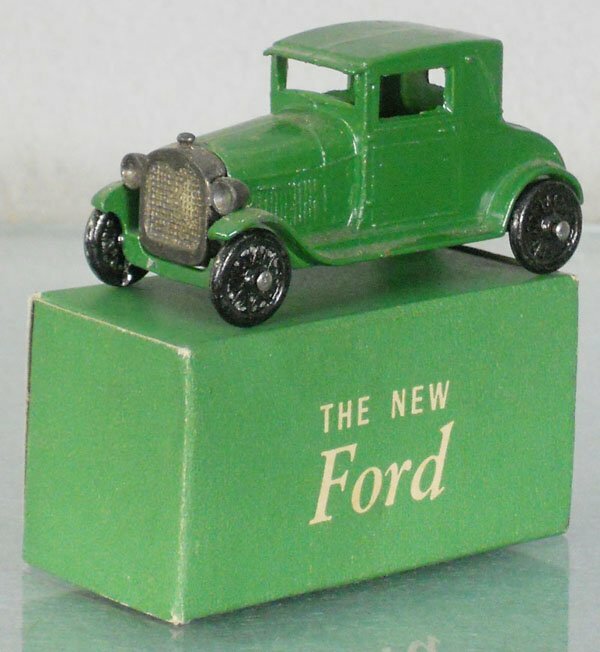 In 1929, the sedan was added to the Model A line, and had somewhat more rounded lines, and a nice cast-on rear spare tyre with "Ford" in script across the wheel cover. 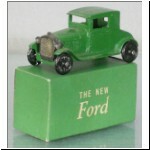 It also showed the gas tank cap in the centre of the cowl, just in front of the windshield. 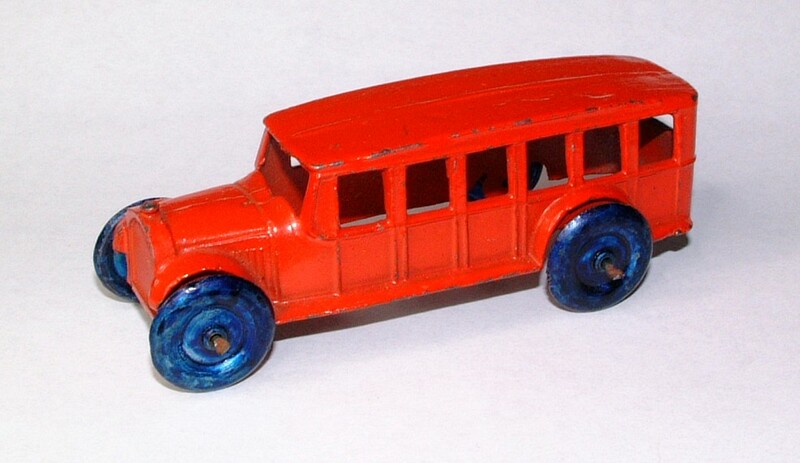 Clint listed the sedan as no.6665, but this was an error for 4665. 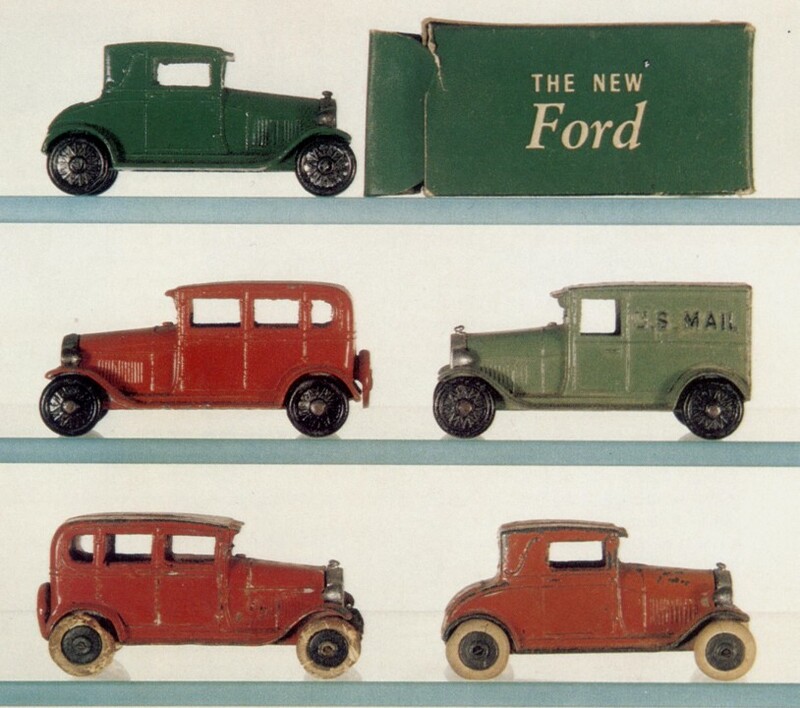 The error was perpetuated in the Wieland & Force book (ref.10). 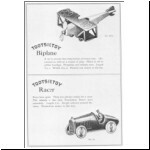 I am not sure how the error occurred, because the correct number is more logical, and was shown in the 1931 leaflet and in catalogues for 1932 and 1933. 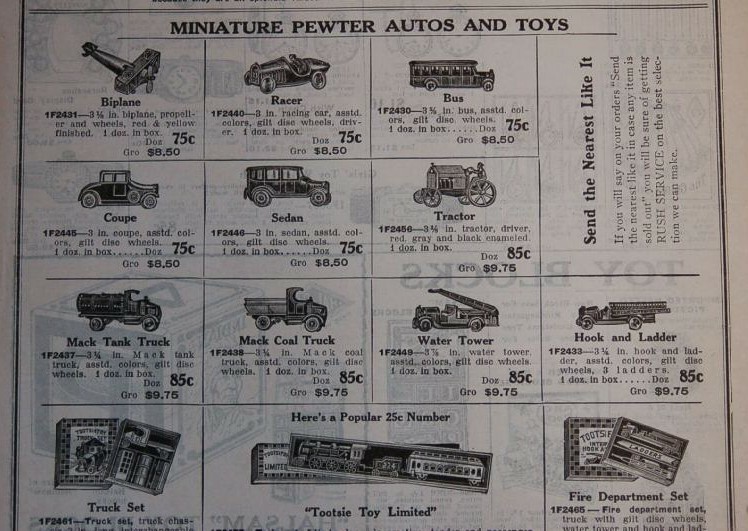 Perhaps 6665 is a misprint in a catalogue that I have not seen. 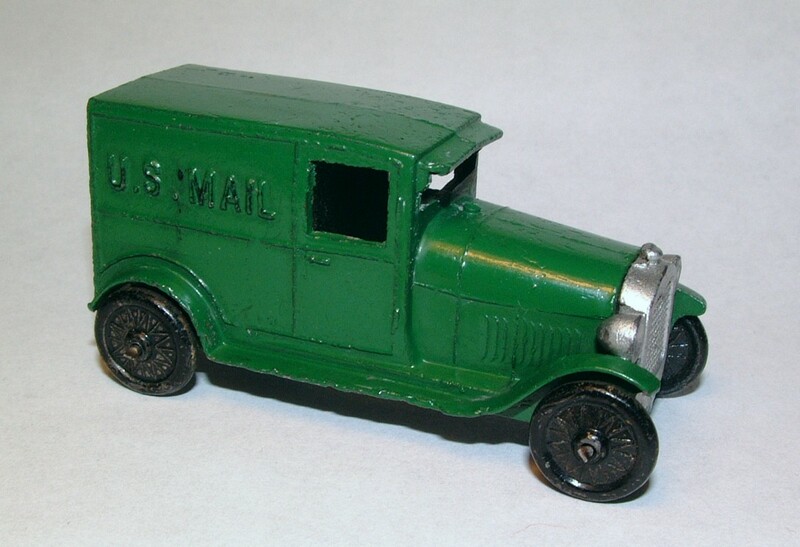 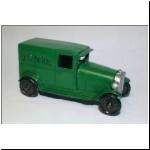 The Mail van did not appear until the 1931 catalogue, and was never listed separately with its own number. 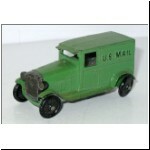 It was invariably shown in boxed sets including the Mack airmail truck, aeroplanes and airport paraphernalia. 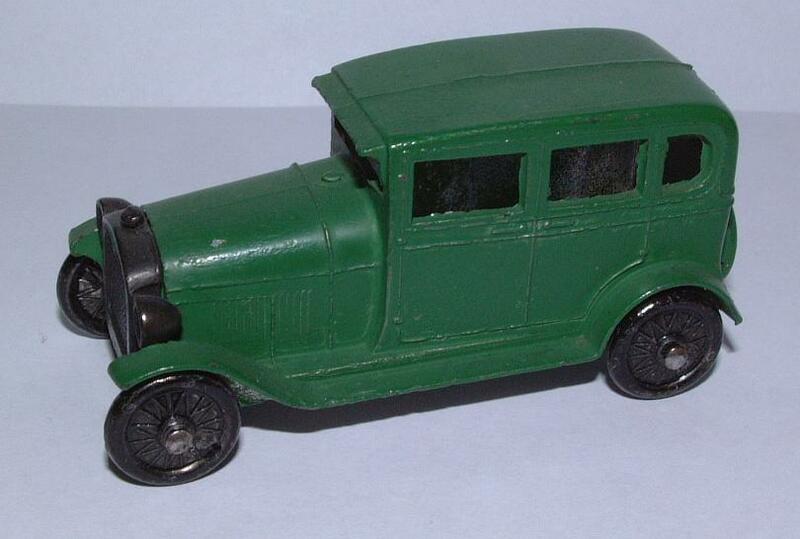 It was either light or dark green. 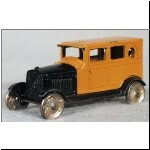 The Model A Fords were fitted with new wheels, representing wire spokes, and were the first deviation from the disc wheels used on other vehicles. 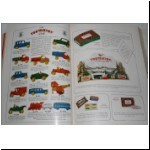 This and the N.Shure catalogue (above) were the first to include the GM series and the "new Ford". 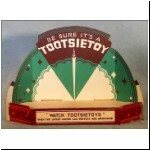 The retailer's counter-top display stand pictured here probably dates from this era. 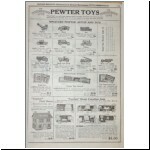 Next month we'll have a look at some of the early patents, and then march on into the early 1930s.